Like most big men in the league, Pau Gasol is largely unappreciated by collectors. However, the explosive seven-footer has seen a resurgence in his career after a move to Chicago and should see some additional hobby interest. His rookie releases are the most likely beneficiaries and a full Paul Gasol rookie card checklist can be seen below. Shop for Pau Gasol cards on eBay. After beginning his professional career with FC Barcelona, Pau Gasol was drafted third overall in the 2001 NBA Draft by the Atlanta Hawks. The Hawks traded his rights to the Memphis Grizzlies and that is where Gasol spent his first years in the NBA. The 2001-02 Rookie of the Year Award and one All-Star appearance gave Gasol some recognition, but it was not until a trade to the Lakers that he made the leap to stardom. The trade is also notable because it included Marc Gasol, Pau's brother, going from LA to Memphis. Pau Gasol had a great run in Los Angeles, earning three All-Star nods and teaming up with Kobe Bryant to win two NBA titles. Although he was one of the most dominant big men in the league during this time, the Lakers quickly unraveled and Gasol was rumored to be on trading block for some time. This ultimately never occurred and he signed as a free agent with the Chicago Bulls, where he earned another All-Star selection in his first season and has the Bulls primed for a deep playoff run. The first Pau Gasol cards came from Sage and eTopps in 2001. Sage also included autographed cards. 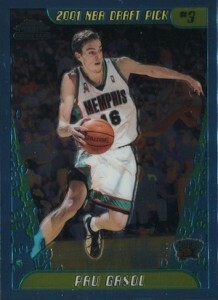 The official rookie cards for Gasol were released in 2001-02 products and the majority of the 30+ cards are found for budget prices. The one signed card is actually autographed only by Kevin Garnett and the top overall card for collectors is his 2001-02 Ultimate rookie. 2001-02 Topps Chrome is also a popular option. 2017 LEAF Q PAU GASOL JUMBO PATCH # 2 9 NICE 4 COLOR PATCH!